Akamu (Igbo), Ogi (Yoruba) or Pap is Nigerian corn meal made from wet corn starch. It has a distinctive sour taste that makes people crave it. It is processed from dry white or yellow corn. After processing it we get the raw akamu/pap/ogi which is then prepared with hot water before serving as a meal. 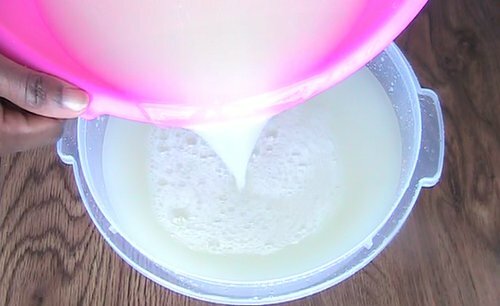 On this page, I will explain how to process the raw wet corn starch from dry corn. 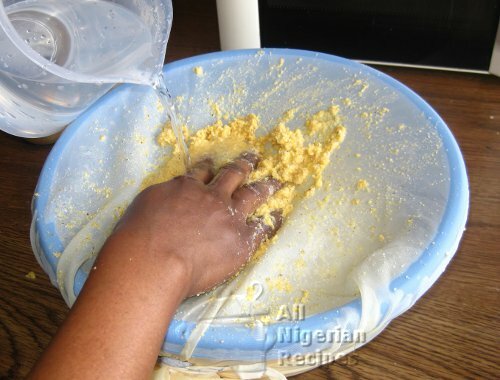 If you are looking for how to prepare the corn meal visit the How to Prepare Akamu/Ogi/Pap page. Blender: I used Palson with 600W. I got about 1.2kg akamu from the 1.5kg dry corn. The corn must be dry. Fresh corn cannot form the right kind of starch for making akamu/ogi/pap. 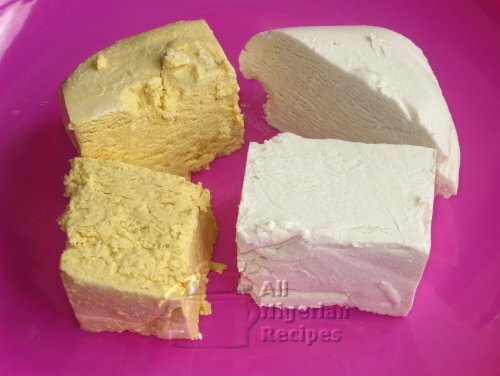 We use yellow dry corn for making yellow akamu and white (off-white) corn for making white akamu. You will need lots of water for soaking, washing and seiving the corn. Never let salt come in contact with the corn, water and utensils you will use to process the akamu because when that happens, the akamu will not thicken when you prepare it with hot water. Wash the dry corn thoroughly and soak in a generous quantity of cold water for 3 to 4 days. Do not refrigerate it because it is important that some kind of fermentation takes place. On the 3rd or 4th day, wash and blend till smooth. I say 3rd or 4th because some corns become soft enough to be blended by the 3rd day. Bite into it to check, if not soak for one more day. Add a generous quantity of water to help your blender. In Nigeria, heavy duty grinders are used for this purpose. Drape the chiffon cloth over a big bowl and tie it up. The bowl should be big enough to accommodate the ogi and the water you'll use to rinse it and then some. Sieve the blend rinsing as necessary till you are left with only the chaff. 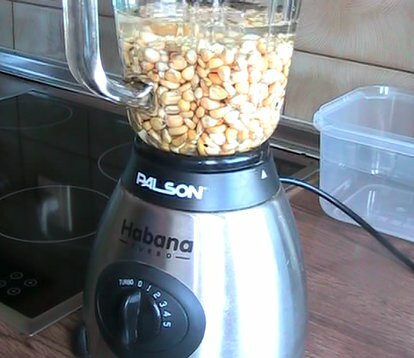 It is advisable to rinse small quantities of the corn blend at a time so that you will not be overwhelmed. When you've rinsed all the corn blend, blend the chaff and rinse again if you think you can get more akamu from it. This may be the case if you used a kitchen blender. This won't be necessary if you used the heavy duty grinders in Nigerian markets. When done, take off the chiffon cloth and set the mixture of water and akamu aside to settle for at least 3 hours. 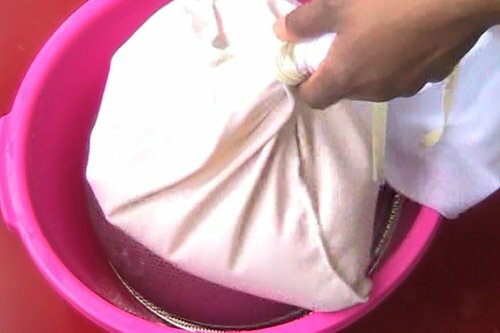 After about 3 hours or when you notice that the water is clear, decant the clear water and pour the rest of the mixture into the muslin bag. When you notice that the water has drained off, tie the bag tighter and leave to continue draining the water. Repeat the process as the water drains till no more water drains off. The next day, bring out the akamu from the bag, cut it up into single-use chunks, place in containers (bowls or plastic bags) and put in your freezer till you are ready to use it. I prefer the yellow akamu/ogi/pap because it tastes a little bit better. Some people may not notice the slight difference in taste.